Hypertension (HTN or HT), also known as high blood pressure or arterial hypertension, is a chronic medical condition in which the blood pressure in the arteries is persistently elevated. Blood pressure is expressed by two measurements, the systolic and diastolic pressures, which are the maximum and minimum pressures, respectively, in the arterial system. The systolic pressure occurs when the left ventricle is most contracted; the diastolic pressure occurs when the left ventricle is most relaxed prior to the next contraction. Normal blood pressure at rest is within the range of 100–140 millimeters mercury (mmHg) systolic and 60–90 mmHg diastolic. Hypertension is present if the blood pressure is persistently at or above 140/90 mmHg for most adults; different numbers apply to children. Hypertension usually does not cause symptoms initially, but sustained hypertension over time is a major risk factor for hypertensive heart disease, coronary artery disease, stroke, aortic aneurysm, peripheral artery disease, and chronic kidney disease. Hypertension is classified as either primary (essential) hypertension or secondary hypertension. About 90–95% of cases are categorized as primary hypertension, defined as high blood pressure with no obvious underlying cause. The remaining 5–10% of cases are categorized as secondary hypertension, defined as hypertension due to an identifiable cause, such as chronic kidney disease, narrowing of the aorta or kidney arteries, or an endocrine disorder such as excess aldosterone, cortisol, or catecholamines. Dietary and lifestyle changes can improve blood pressure control and decrease the risk of health complications, although treatment with medication is still often necessary in people for whom lifestyle changes are not enough or not effective. The treatment of moderately high arterial blood pressure (defined as >160/100 mmHg) with medications is associated with an improved life expectancy. The benefits of treatment of blood pressure that is between 140/90 mmHg and 160/100 mmHg are less clear, with some reviews finding no benefit and others finding benefit. Hypertension is rarely accompanied by any symptoms, and its identification is usually through screening, or when seeking healthcare for an unrelated problem. Some with high blood pressure report headaches (particularly at the back of the head and in the morning), as well as lightheadedness, vertigo, tinnitus (buzzing or hissing in the ears), altered vision or fainting episodes. These symptoms, however, might be related to associated anxiety rather than the high blood pressure itself. Hypertension with certain specific additional signs and symptoms may suggest secondary hypertension, i.e. hypertension due to an identifiable cause. For example, Cushing's syndrome frequently causes truncal obesity, glucose intolerance, moon face, a hump of fat behind the neck/shoulder, and purple abdominal stretch marks. Hyperthyroidism frequently causes weight loss with increased appetite, fast heart rate, bulging eyes, and tremor. Renal artery stenosis (RAS) may be associated with a localized abdominal bruit to the left or right of the midline (unilateral RAS), or in both locations (bilateral RAS). Coarctation of the aorta frequently causes a decreased blood pressure in the lower extremities relative to the arms, and/or delayed or absent femoral arterial pulses. . Pheochromocytoma may cause abrupt ("paroxysmal") episodes of hypertension accompanied by headache, palpitations, pale appearance, and excessive sweating. Severely elevated blood pressure (equal to or greater than a systolic 180 or diastolic of 110) is referred to as a hypertensive crisis. Hypertensive crisis is categorized as either hypertensive urgency or hypertensive emergency, according to the presence or absence of end organ damage. In hypertensive emergency, there is evidence of direct damage to one or more organs. The most affected organs include the brain, kidney, heart and lungs, producing symptoms which may include confusion, drowsiness, chest pain and breathlessness. In hypertensive emergency, the blood pressure must be reduced rapidly to stop ongoing organ damage. Hypertension occurs in approximately 8–10% of pregnancies. Two blood pressure measurements six hours apart of greater than 140/90 mm Hg is considered diagnostic of hypertension in pregnancy. High blood pressure in pregnancy can be classified as pre-existing hypertension, gestational hypertension or pre-eclampsia. Pre-eclampsia is a serious condition of the second half of pregnancy and following delivery characterised by increased blood pressure and the presence of protein in the urine. It occurs in about 5% of pregnancies and is responsible for approximately 16% of all maternal deaths globally. Pre-eclampsia also doubles the risk of perinatal mortality. Usually there are no symptoms in pre-eclampsia and it is detected by routine screening. When symptoms of pre-eclampsia occur the most common are headache, visual disturbance (often "flashing lights"), vomiting, pain over the stomach, and swelling. Pre-eclampsia can occasionally progress to a life-threatening condition called eclampsia, which is a hypertensive emergency and has several serious complications including vision loss, brain swelling, seizures, kidney failure, pulmonary edema, and disseminated intravascular coagulation (a blood clotting disorder). Failure to thrive, seizures, irritability, lack of energy, and difficulty breathing can be associated with hypertension in neonates and young infants. In older infants and children, hypertension can cause headache, unexplained irritability, fatigue, failure to thrive, blurred vision, nosebleeds, and facial paralysis. Hypertension results from a complex interaction of genes and environmental factors. Numerous common genetic variants with small effects on blood pressure have been identified as well as some rare genetic variants with large effects on blood pressure, but the genetic basis of hypertension is still poorly understood. Blood pressure rises with aging and the risk of becoming hypertensive in later life is considerable. Several environmental factors influence blood pressure. High salt intake raises the blood pressure in salt sensitive individuals; lack of exercise, obesity, stress, and depression can play a role in individual cases. The possible role of other factors such as caffeine consumption, and vitamin D deficiency are less clear. Insulin resistance, which is common in obesity and is a component of syndrome X (or the metabolic syndrome), is also thought to contribute to hypertension. Events in early life, such as low birth weight, maternal smoking, and lack of breast feeding may be risk factors for adult essential hypertension, although the mechanisms linking these exposures to adult hypertension remain unclear. Secondary hypertension results from an identifiable cause. Kidney disease is the most common secondary cause of hypertension. Hypertension can also be caused by endocrine conditions, such as Cushing's syndrome, hyperthyroidism, hypothyroidism, acromegaly, Conn's syndrome or hyperaldosteronism, hyperparathyroidism and pheochromocytoma. Other causes of secondary hypertension include obesity, sleep apnea, pregnancy, coarctation of the aorta, excessive liquorice consumption and certain prescription medicines, herbal remedies and illegal drugs. Arsenic exposure through drinking water has been shown to correlate with elevated blood pressure. In most people with established essential hypertension, increased resistance to blood flow (total peripheral resistance) accounts for the high pressure while cardiac output remains normal. There is evidence that some younger people with prehypertension or 'borderline hypertension' have high cardiac output, an elevated heart rate and normal peripheral resistance, termed hyperkinetic borderline hypertension. These individuals develop the typical features of established essential hypertension in later life as their cardiac output falls and peripheral resistance rises with age. Whether this pattern is typical of all people who ultimately develop hypertension is disputed. The increased peripheral resistance in established hypertension is mainly attributable to structural narrowing of small arteries and arterioles, although a reduction in the number or density of capillaries may also contribute. Whether increased active arteriolar vasoconstriction plays a role in established essential hypertension is unclear. Hypertension is also associated with decreased peripheral venous compliance which may increase venous return, increase cardiac preload and, ultimately, cause diastolic dysfunction. Pulse pressure (the difference between systolic and diastolic blood pressure) is frequently increased in older people with hypertension. This can mean that systolic pressure is abnormally high, but diastolic pressure may be normal or low — a condition termed isolated systolic hypertension. The high pulse pressure in elderly people with hypertension or isolated systolic hypertension is explained by increased arterial stiffness, which typically accompanies aging and may be exacerbated by high blood pressure. Many mechanisms have been proposed to account for the rise in peripheral resistance in hypertension. Most evidence implicates either disturbances in the kidneys' salt and water handling (particularly abnormalities in the intrarenal renin-angiotensin system) and/or abnormalities of the sympathetic nervous system. These mechanisms are not mutually exclusive and it is likely that both contribute to some extent in most cases of essential hypertension. It has also been suggested that endothelial dysfunction and vascular inflammation may also contribute to increased peripheral resistance and vascular damage in hypertension. Interleukin 17 has garnered interest for its role in increasing the production of several other immune system chemical signals thought to be involved in hypertension such as tumor necrosis factor alpha, interleukin 1, interleukin 6, and interleukin 8. Hypertension is diagnosed on the basis of a persistently high blood pressure. Traditionally, the National Institute of Clinical Excellence recommends three separate sphygmomanometer measurements at one monthly intervals. The American Heart Association recommends at least three measurements on at least two separate health care visits. Ambulatory blood pressure monitoring over 12 to 24 hours is the most accurate method to confirm the diagnosis. An exception to this is those with very high blood pressure readings especially when there is poor organ function. 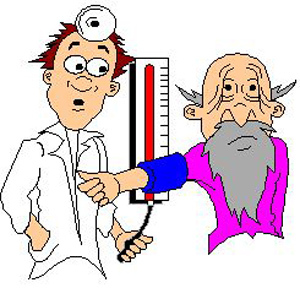 Initial assessment of the hypertensive people should include a complete history and physical examination. With the availability of 24-hour ambulatory blood pressure monitors and home blood pressure machines, the importance of not wrongly diagnosing those who have white coat hypertension has led to a change in protocols. In the United Kingdom, current best practice is to follow up a single raised clinic reading with ambulatory measurement, or less ideally with home blood pressure monitoring over the course of 7 days. The United States Preventative Services Task Force also recommends getting measurements outside of the healthcare environment. Pseudohypertension in the elderly or noncompressibility artery syndrome may also require consideration. This condition is believed to be due to calcification of the arteries resulting in abnormally high blood pressure readings with a blood pressure cuff while intra arterial measurements of blood pressure are normal. Orthostatic hypertension is when blood pressure increases upon standing. Serum creatinine is measured to assess for the presence of kidney disease, which can be either the cause or the result of hypertension. Serum creatinine alone may overestimate glomerular filtration rate and recent guidelines advocate the use of predictive equations such as the Modification of Diet in Renal Disease (MDRD) formula to estimate glomerular filtration rate (eGFR). eGFR can also provide a baseline measurement of kidney function that can be used to monitor for side effects of certain antihypertensive drugs on kidney function. Additionally, testing of urine samples for protein is used as a secondary indicator of kidney disease. Electrocardiogram (EKG/ECG) testing is done to check for evidence that the heart is under strain from high blood pressure. It may also show whether there is thickening of the heart muscle (left ventricular hypertrophy) or whether the heart has experienced a prior minor disturbance such as a silent heart attack. A chest X-ray or an echocardiogram may also be performed to look for signs of heart enlargement or damage to the heart. In people aged 18 years or older hypertension is defined as a systolic and/or a diastolic blood pressure measurement consistently higher than an accepted normal value (currently 139 mmHg systolic, 89 mmHg diastolic: see table—Classification (JNC7)). Lower thresholds are used (135 mmHg systolic or 85 mmHg diastolic) if measurements are derived from 24-hour ambulatory or home monitoring. Recent international hypertension guidelines have also created categories below the hypertensive range to indicate a continuum of risk with higher blood pressures in the normal range. JNC7 (2003) uses the term prehypertension for blood pressure in the range 120–139 mmHg systolic and/or 80–89 mmHg diastolic, while ESH-ESC Guidelines (2007) and BHS IV (2004) use optimal, normal and high normal categories to subdivide pressures below 140 mmHg systolic and 90 mmHg diastolic. Hypertension is also sub-classified: JNC7 distinguishes hypertension stage I, hypertension stage II, and isolated systolic hypertension. Isolated systolic hypertension refers to elevated systolic pressure with normal diastolic pressure and is common in the elderly. The ESH-ESC Guidelines (2007) and BHS IV (2004) additionally define a third stage (stage III hypertension) for people with systolic blood pressure exceeding 179 mmHg or a diastolic pressure over 109 mmHg. Hypertension is classified as "resistant" if medications do not reduce blood pressure to normal levels. The value of routine screening for hypertension in children over the age of 3 years is debated. In 2004 the National High Blood Pressure Education Program recommended that children aged 3 years and older have blood pressure measurement at least once at every health care visit and the National Heart, Lung, and Blood Institute and American Academy of Pediatrics made a similar recommendation. However, the American Academy of Family Physicians support the view of the U.S. preventive Services Task Force that evidence is insufficient to determine the balance of benefits and harms of screening for hypertension in children and adolescents who do not have symptoms. According to one review published in 2003, reduction of the blood pressure by 5 mmHg can decrease the risk of stroke by 34%, of ischaemic heart disease by 21%, and reduce the likelihood of dementia, heart failure, and mortality from cardiovascular disease. Various expert groups have produced guidelines regarding how low the blood pressure target should be when a person is treated for hypertension. These groups recommend a target below the range 140-160 / 90-100 mmHg for the general population. Controversy exists regarding the appropriate targets for certain subgroups, including the elderly, people with diabetes and people with kidney disease. Many expert groups recommend a slightly higher target of 150/90 mmHg for those over 80 years of age. One expert group, the JNC-8, recommends the target of 150/90 mmHg for those over 60 years of age, but some experts within this group disagree with this recommendation. Some expert groups have also recommended slightly lower targets in those with diabetes or chronic kidney disease with proteinuria, but others recommend the same target as for the general population. The first line of treatment for hypertension is lifestyle changes, including dietary changes, physical exercise, and weight loss. These have all been shown to significantly reduce blood pressure in people with hypertension. Their potential effectiveness is similar to and at times exceeds a single medication. If hypertension is high enough to justify immediate use of medications, lifestyle changes are still recommended in conjunction with medication. Dietary changes shown to reduce blood pressure include diets with low sodium, the DASH diet, vegetarian diets and high potassium diets. Stress reduction techniques such as biofeedback or transcendental meditation may be considered as an add-on to other treatments to reduce hypertension, but do not have evidence for preventing cardiovascular disease on their own. First line medications for hypertension include thiazide-diuretics, calcium channel blockers, angiotensin converting enzyme inhibitors and angiotensin receptor blockers. These drugs may be used alone or in combination. The majority of people require more than one medication to control their hypertension. Resistant hypertension is defined as hypertension that remains above goal blood pressure in spite of using, at once, three antihypertensive medications belonging to different drug classes. Low adherence to treatment is an important cause of resistant hypertension. Resistant hypertension may also represent the result of chronic high activity of the autonomic nervous system; this concept is known as "neurogenic hypertension". As of 2000, nearly one billion people or ~26% of the adult population of the world had hypertension. It was common in both developed (333 million) and undeveloped (639 million) countries. However, rates vary markedly in different regions with rates as low as 3.4% (men) and 6.8% (women) in rural India and as high as 68.9% (men) and 72.5% (women) in Poland. In Europe hypertension occurs in about 30-45% of people as of 2013. In 1995 it was estimated that 43 million people in the United States had hypertension or were taking antihypertensive medication, almost 24% of the adult United States population. The prevalence of hypertension in the United States is increasing and reached 29% in 2004. As of 2006 hypertension affects 76 million US adults (34% of the population) and African American adults have among the highest rates of hypertension in the world at 44%. It is more common in blacks and less in whites and Mexican Americans, rates increase with age, and is greater in the southeastern United States. Hypertension is more common in men (though menopause tends to decrease this difference) and in those of low socioeconomic status. Rates of high blood pressure in children and adolescents have increased in the last 20 years in the United States. Childhood hypertension, particularly in preadolescents, is more often secondary to an underlying disorder than in adults. Kidney disease is the most common secondary cause of hypertension in children and adolescents. Nevertheless, primary or essential hypertension accounts for most cases. Hypertension is the most important preventable risk factor for premature death worldwide. It increases the risk of ischemic heart disease strokes, peripheral vascular disease, and other cardiovascular diseases, including heart failure, aortic aneurysms, diffuse atherosclerosis, chronic kidney disease, and pulmonary embolism. 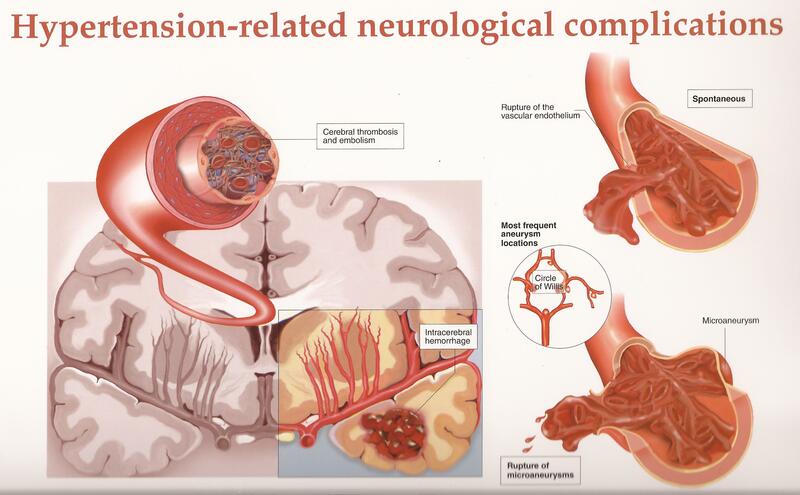 Hypertension is also a risk factor for cognitive impairment and dementia. Other complications include hypertensive retinopathy and hypertensive nephropathy. Modern understanding of the cardiovascular system began with the work of physician William Harvey (1578–1657), who described the circulation of blood in his book "De motu cordis". The English clergyman Stephen Hales made the first published measurement of blood pressure in 1733. However hypertension as a clinical entity came into being in 1896 with the invention of the cuff-based sphygmomanometer by Scipione Riva-Rocci in 1896. This allowed the measurement of blood pressure in the clinic. In 1905, Nikolai Korotkoff improved the technique by describing the Korotkoff sounds that are heard when the artery is ausculated with a stethoscope while the sphygmomanometer cuff is deflated. The first chemical for hypertension, sodium thiocyanate, was used in 1900 but had many side effects and was unpopular. Several other agents were developed after the Second World War, the most popular and reasonably effective of which were tetramethylammonium chloride, hexamethonium, hydralazine and reserpine (derived from the medicinal plant Rauwolfia serpentina). None of these were well tolerated. A major breakthrough was achieved with the discovery of the first well-tolerated orally available agents. The first was chlorothiazide, the first thiazide diuretic and developed from the antibiotic sulfanilamide, which became available in 1958. Subsequently beta blockers, calcium channel blockers, angiotensin converting enzyme (ACE) inhibitors, angiotensin receptor blockers and renin inhibitors were developed as antihypertensive agents. High blood pressure is the most common chronic medical problem prompting visits to primary health care providers in USA. The American Heart Association estimated the direct and indirect costs of high blood pressure in 2010 as $76.6 billion. In the US 80% of people with hypertension are aware of their condition, 71% take some antihypertensive medication, but only 48% of people aware that they have hypertension adequately control it. Adequate management of hypertension can be hampered by inadequacies in the diagnosis, treatment, and/or control of high blood pressure. Health care providers face many obstacles to achieving blood pressure control, including resistance to taking multiple medications to reach blood pressure goals. People also face the challenges of adhering to medicine schedules and making lifestyle changes. Nonetheless, the achievement of blood pressure goals is possible, and most importantly, lowering blood pressure significantly reduces the risk of death due to heart disease and stroke, the development of other debilitating conditions, and the cost associated with advanced medical care. ^ a b c d e f James, PA.; Oparil, S.; Carter, BL. ; Cushman, WC. ; Dennison-Himmelfarb, C.; Handler, J.; Lackland, DT. ; Lefevre, ML. ; et al. (Dec 2013). "2014 Evidence-Based Guideline for the Management of High Blood Pressure in Adults: Report From the Panel Members Appointed to the Eighth Joint National Committee (JNC 8)". JAMA 311 (5): 507–20. doi:10.1001/jama.2013.284427. PMID 24352797. ^ Lewington, S; Clarke, R; Qizilbash, N; Peto, R; Collins, R; Prospective Studies, Collaboration (Dec 14, 2002). "Age-specific relevance of usual blood pressure to vascular mortality: a meta-analysis of individual data for one million adults in 61 prospective studies.". Lancet 360 (9349): 1903–13. doi:10.1016/s0140-6736(02)11911-8. PMID 12493255. ^ a b c d Carretero OA, Oparil S; Oparil (January 2000). "Essential hypertension. Part I: definition and etiology". Circulation 101 (3): 329–35. doi:10.1161/01.CIR.101.3.329. PMID 10645931. ^ Musini, VM; Tejani, AM; Bassett, K; Wright, JM (7 October 2009). "Pharmacotherapy for hypertension in the elderly.". The Cochrane database of systematic reviews (4): CD000028. doi:10.1002/14651858.CD000028.pub2. PMID 19821263. ^ Diao, D; Wright, JM; Cundiff, DK; Gueyffier, F (Aug 15, 2012). "Pharmacotherapy for mild hypertension.". The Cochrane database of systematic reviews 8: CD006742. doi:10.1002/14651858.CD006742.pub2. PMID 22895954. ^ Sundström, Johan; Arima, Hisatomi; Jackson, Rod; Turnbull, Fiona; Rahimi, Kazem; Chalmers, John; Woodward, Mark; Neal, Bruce (February 2015). "Effects of Blood Pressure Reduction in Mild Hypertension". Annals of Internal Medicine 162: 184–91. doi:10.7326/M14-0773. PMID 25531552. ^ Xie, X; Atkins, E; Lv, J; Bennett, A; Neal, B; Ninomiya, T; Woodward, M; MacMahon, S; Turnbull, F; Hillis, GS; Chalmers, J; Mant, J; Salam, A; Rahimi, K; Perkovic, V; Rodgers, A (7 November 2015). "Effects of intensive blood pressure lowering on cardiovascular and renal outcomes: updated systematic review and meta-analysis.". Lancet (London, England). doi:10.1016/S0140-6736(15)00805-3. PMID 26559744. ^ a b Fisher ND, Williams GH (2005). "Hypertensive vascular disease". In Kasper DL, Braunwald E, Fauci AS; et al. Harrison's Principles of Internal Medicine (16th ed.). New York, NY: McGraw-Hill. pp. 1463–81. ISBN 0-07-139140-1. ^ a b Marshall, IJ; Wolfe, CD; McKevitt, C (Jul 9, 2012). "Lay perspectives on hypertension and drug adherence: systematic review of qualitative research". BMJ (Clinical research ed.) 345: e3953. doi:10.1136/bmj.e3953. PMC 3392078. PMID 22777025. ^ a b Wong T, Mitchell P; Mitchell (February 2007). 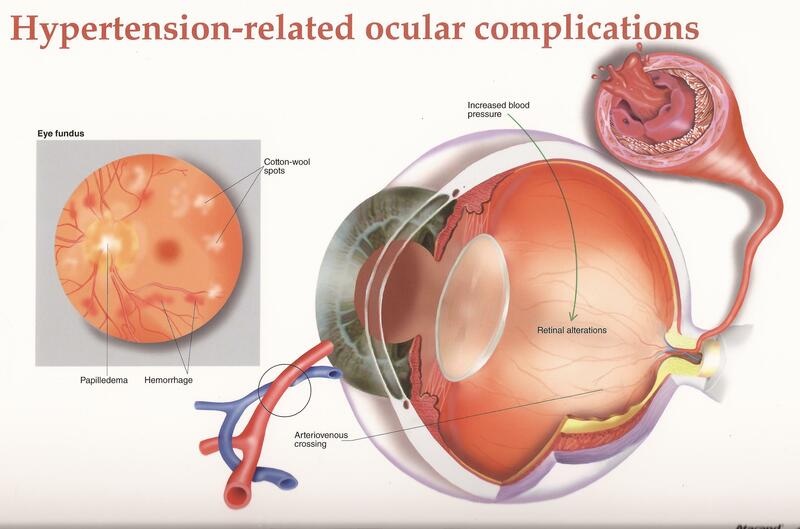 "The eye in hypertension". Lancet 369 (9559): 425–35. doi:10.1016/S0140-6736(07)60198-6. PMID 17276782. ^ a b c d e f g h i j k l m n O'Brien, Eoin; Beevers, D. G.; Lip, Gregory Y. H. (2007). ABC of hypertension. London: BMJ Books. ISBN 1-4051-3061-X. ^ Rodriguez, Maria Alexandra; Kumar, Siva K.; De Caro, Matthew (2010-04-01). "Hypertensive crisis". Cardiology in Review 18 (2): 102–107. doi:10.1097/CRD.0b013e3181c307b7. ISSN 1538-4683. PMID 20160537. ^ "Hypertensive Crisis". www.heart.org. Retrieved 2015-07-25. ^ a b c Marik PE, Varon J; Varon (June 2007). "Hypertensive crises: challenges and management". Chest 131 (6): 1949–62. doi:10.1378/chest.06-2490. PMID 17565029. ^ Chobanian, AV; Bakris, GL; Black, HR; Cushman, WC; Green, LA; Izzo JL, Jr; Jones, DW; Materson, BJ; Oparil, S; Wright JT, Jr; Roccella, EJ; Joint National Committee on Prevention, Detection, Evaluation, and Treatment of High Blood Pressure. National Heart, Lung, and Blood, Institute; National High Blood Pressure Education Program Coordinating, Committee (Dec 2003). "Seventh report of the Joint National Committee on Prevention, Detection, Evaluation, and Treatment of High Blood Pressure". Hypertension 42 (6): 1206–52. doi:10.1161/01.hyp.0000107251.49515.c2. PMID 14656957. ^ Harrison's principles of internal medicine. (18th ed.). New York: McGraw-Hill. 2011. pp. 55–61. ISBN 9780071748896. ^ a b "Management of hypertension in pregnant and postpartum women". www.uptodate.com. Retrieved 2015-07-30. ^ Gibson, Paul (July 30, 2009). "Hypertension and Pregnancy". eMedicine Obstetrics and Gynecology. Medscape. Retrieved 16 June 2009. ^ a b Rodriguez-Cruz, Edwin; Ettinger, Leigh M (April 6, 2010). "Hypertension". eMedicine Pediatrics: Cardiac Disease and Critical Care Medicine. Medscape. Retrieved 16 June 2009. ^ a b c Dionne JM, Abitbol CL, Flynn JT; Abitbol; Flynn (January 2012). "Hypertension in infancy: diagnosis, management and outcome". Pediatr. Nephrol. 27 (1): 17–32. doi:10.1007/s00467-010-1755-z. PMID 21258818. ^ Ehret GB, Munroe PB, Rice KM, et al. (October 2011). "Genetic variants in novel pathways influence blood pressure and cardiovascular disease risk". Nature 478 (7367): 103–9. doi:10.1038/nature10405. PMC 3340926. PMID 21909115. ^ Lifton, RP; Gharavi, AG, Geller, DS (2001-02-23). "Molecular mechanisms of human hypertension". Cell 104 (4): 545–56. doi:10.1016/S0092-8674(01)00241-0. PMID 11239411. ^ Vasan, RS; Beiser, A; Seshadri, S; Larson, MG; Kannel, WB; D'Agostino, RB; Levy, D (2002-02-27). "Residual lifetime risk for developing hypertension in middle-aged women and men: The Framingham Heart Study". JAMA: the Journal of the American Medical Association 287 (8): 1003–10. doi:10.1001/jama.287.8.1003. PMID 11866648. ^ Meng, L; Chen, D; Yang, Y; Zheng, Y; Hui, R (May 2012). "Depression increases the risk of hypertension incidence: a meta-analysis of prospective cohort studies.". Journal of Hypertension 30 (5): 842–51. doi:10.1097/hjh.0b013e32835080b7. PMID 22343537. ^ Mesas, AE; Leon-Muñoz, LM; Rodriguez-Artalejo, F; Lopez-Garcia, E (October 2011). "The effect of coffee on blood pressure and cardiovascular disease in hypertensive individuals: a systematic review and meta-analysis". The American journal of clinical nutrition 94 (4): 1113–26. doi:10.3945/ajcn.111.016667. PMID 21880846. ^ Vaidya A, Forman JP; Forman (November 2010). "Vitamin D and hypertension: current evidence and future directions". Hypertension 56 (5): 774–9. doi:10.1161/HYPERTENSIONAHA.109.140160. PMID 20937970. ^ Sorof J, Daniels S; Daniels (October 2002). "Obesity hypertension in children: a problem of epidemic proportions". Hypertension 40 (4): 441–447. doi:10.1161/01.HYP.0000032940.33466.12. PMID 12364344. Retrieved 3 June 2009. ^ Lawlor, DA; Smith, GD (May 2005). "Early life determinants of adult blood pressure". Current Opinion in Nephrology and Hypertension 14 (3): 259–64. doi:10.1097/01.mnh.0000165893.13620.2b. PMID 15821420. ^ Dluhy RG, Williams GH eds (1998). "Endocrine hypertension". In Wilson JD, Foster DW, Kronenberg HM. Williams textbook of endocrinology (9th ed.). Philadelphia ; Montreal: W.B. Saunders. pp. 729–49. ISBN 0721661521. ^ Grossman E, Messerli FH; Messerli (January 2012). "Drug-induced Hypertension: An Unappreciated Cause of Secondary Hypertension". Am. J. Med. 125 (1): 14–22. doi:10.1016/j.amjmed.2011.05.024. PMID 22195528. ^ Jieying Jiang, Mengling Liu, Faruque Parvez; et al. (August 2015). "Association between Arsenic Exposure from Drinking Water and Longitudinal Change in Blood Pressure among HEALS Cohort Participants". Environ Health Perspectives 123 (8). doi:10.1289/ehp.1409004. ^ Abhyankar, LN; Jones, MR; Guallar, E; Navas-Acien, A (April 2012). "Arsenic exposure and hypertension: a systematic review.". Environmental health perspectives 120 (4): 494–500. doi:10.1289/ehp.1103988. PMID 22138666. ^ Conway J (April 1984). "Hemodynamic aspects of essential hypertension in humans". Physiol. Rev. 64 (2): 617–60. PMID 6369352. ^ a b Palatini P, Julius S; Julius (June 2009). "The role of cardiac autonomic function in hypertension and cardiovascular disease". Curr. Hypertens. Rep. 11 (3): 199–205. doi:10.1007/s11906-009-0035-4. PMID 19442329. ^ Andersson OK, Lingman M, Himmelmann A, Sivertsson R, Widgren BR; Lingman; Himmelmann; Sivertsson; Widgren (2004). "Prediction of future hypertension by casual blood pressure or invasive hemodynamics? A 30-year follow-up study". Blood Press. 13 (6): 350–4. doi:10.1080/08037050410004819. PMID 15771219. ^ Folkow B (April 1982). "Physiological aspects of primary hypertension". Physiol. Rev. 62 (2): 347–504. PMID 6461865. ^ Struijker Boudier HA, le Noble JL, Messing MW, Huijberts MS, le Noble FA, van Essen H; Le Noble; Messing; Huijberts; Le Noble; Van Essen (December 1992). "The microcirculation and hypertension". J Hypertens Suppl 10 (7): S147–56. doi:10.1097/00004872-199212000-00016. PMID 1291649. ^ Schiffrin EL (February 1992). "Reactivity of small blood vessels in hypertension: relation with structural changes. State of the art lecture". Hypertension 19 (2 Suppl): II1–9. doi:10.1161/01.HYP.19.2_Suppl.II1-a. PMID 1735561. ^ Safar ME, London GM; London (August 1987). "Arterial and venous compliance in sustained essential hypertension". Hypertension 10 (2): 133–9. doi:10.1161/01.HYP.10.2.133. PMID 3301662. ^ Chobanian AV (August 2007). "Clinical practice. Isolated systolic hypertension in the elderly". N. Engl. J. Med. 357 (8): 789–96. doi:10.1056/NEJMcp071137. PMID 17715411. ^ Zieman SJ, Melenovsky V, Kass DA; Melenovsky; Kass (May 2005). "Mechanisms, pathophysiology, and therapy of arterial stiffness". Arterioscler. Thromb. Vasc. Biol. 25 (5): 932–43. doi:10.1161/01.ATV.0000160548.78317.29. PMID 15731494. ^ Navar LG (December 2010). "Counterpoint: Activation of the intrarenal renin-angiotensin system is the dominant contributor to systemic hypertension". J. Appl. Physiol. 109 (6): 1998–2000; discussion 2015. doi:10.1152/japplphysiol.00182.2010a. PMC 3006411. PMID 21148349. ^ Esler M, Lambert E, Schlaich M; Lambert; Schlaich (December 2010). "Point: Chronic activation of the sympathetic nervous system is the dominant contributor to systemic hypertension". J. Appl. Physiol. 109 (6): 1996–8; discussion 2016. doi:10.1152/japplphysiol.00182.2010. PMID 20185633. ^ Versari D, Daghini E, Virdis A, Ghiadoni L, Taddei S; Daghini; Virdis; Ghiadoni; Taddei (June 2009). "Endothelium-dependent contractions and endothelial dysfunction in human hypertension". Br. J. Pharmacol. 157 (4): 527–36. doi:10.1111/j.1476-5381.2009.00240.x. PMC 2707964. PMID 19630832. ^ Marchesi C, Paradis P, Schiffrin EL; Paradis; Schiffrin (July 2008). "Role of the renin-angiotensin system in vascular inflammation". Trends Pharmacol. Sci. 29 (7): 367–74. doi:10.1016/j.tips.2008.05.003. PMID 18579222. ^ Gooch JL, Sharma AC; Sharma (July 2014). "Targeting the immune system to treat hypertension: where are we?". Curr Opin Nephrol Hypertens 23 (5): 000–000. doi:10.1097/MNH.0000000000000052. PMID 25036747. ^ Loscalzo, Joseph; Fauci, Anthony S.; Braunwald, Eugene; Dennis L. Kasper; Hauser, Stephen L; Longo, Dan L. (2008). Harrison's principles of internal medicine. McGraw-Hill Medical. ISBN 0-07-147691-1. ^ Padwal RS, Hemmelgarn BR, Khan NA, et al. (May 2009). "The 2009 Canadian Hypertension Education Program recommendations for the management of hypertension: Part 1 – blood pressure measurement, diagnosis and assessment of risk". Canadian Journal of Cardiology 25 (5): 279–86. doi:10.1016/S0828-282X(09)70491-X. PMC 2707176. PMID 19417858. ^ Padwal RJ, Hemmelgarn BR, Khan NA, et al. (June 2008). "The 2008 Canadian Hypertension Education Program recommendations for the management of hypertension: Part 1 – blood pressure measurement, diagnosis and assessment of risk". Canadian Journal of Cardiology 24 (6): 455–63. doi:10.1016/S0828-282X(08)70619-6. PMC 2643189. PMID 18548142. ^ Padwal RS, Hemmelgarn BR, McAlister FA, et al. (May 2007). "The 2007 Canadian Hypertension Education Program recommendations for the management of hypertension: Part 1 – blood pressure measurement, diagnosis and assessment of risk". Canadian Journal of Cardiology 23 (7): 529–38. doi:10.1016/S0828-282X(07)70797-3. PMC 2650756. PMID 17534459. ^ Hemmelgarn BR, McAlister FA, Grover S, et al. (May 2006). "The 2006 Canadian Hypertension Education Program recommendations for the management of hypertension: Part I – Blood pressure measurement, diagnosis and assessment of risk". Canadian Journal of Cardiology 22 (7): 573–81. doi:10.1016/S0828-282X(06)70279-3. PMC 2560864. PMID 16755312. ^ Hemmelgarn BR, McAllister FA, Myers MG, et al. (June 2005). "The 2005 Canadian Hypertension Education Program recommendations for the management of hypertension: part 1- blood pressure measurement, diagnosis and assessment of risk". Canadian Journal of Cardiology 21 (8): 645–56. PMID 16003448. ^ North of England Hypertension Guideline Development Group (1 August 2004). "Frequency of measurements". Essential hypertension (NICE CG18) (PDF). National Institute for Health and Clinical Excellence. p. 53. Retrieved 22 December 2011. ^ a b c d National Clinical Guidance Centre (August 2011). "7 Diagnosis of Hypertension, 7.5 Link from evidence to recommendations". Hypertension (NICE CG 127) (PDF). National Institute for Health and Clinical Excellence. p. 102. Retrieved 22 December 2011. ^ Aronow, WS; Fleg, JL; Pepine, CJ; Artinian, NT; Bakris, G; Brown, AS; Ferdinand, KC; Ann Forciea, M; Frishman, WH; Jaigobin, C; Kostis, JB; Mancia, G; Oparil, S; Ortiz, E; Reisin, E; Rich, MW; Schocken, DD; Weber, MA; Wesley, DJ; Harrington, RA; Bates, ER; Bhatt, DL; Bridges, CR; Eisenberg, MJ; Ferrari, VA; Fisher, JD; Gardner, TJ; Gentile, F; Gilson, MF; Hlatky, MA; Jacobs, AK; Kaul, S; Moliterno, DJ; Mukherjee, D; Rosenson, RS; Stein, JH; Weitz, HH; Wesley, DJ (Jul–Aug 2011). "ACCF/AHA 2011 expert consensus document on hypertension in the elderly: a report of the American College of Cardiology Foundation Task Force on Clinical Expert Consensus Documents developed in collaboration with the American Academy of Neurology, American Geriatrics Society, American Society for Preventive Cardiology, American Society of Hypertension, American Society of Nephrology, Association of Black Cardiologists, and European Society of Hypertension". Journal of the American Society of Hypertension : JASH 5 (4): 259–352. doi:10.1016/j.jash.2011.06.001. PMID 21771565. ^ Siu, AL (13 October 2015). "Screening for High Blood Pressure in Adults: U.S. Preventive Services Task Force Recommendation Statement.". Annals of internal medicine 163: 778–86. doi:10.7326/m15-2223. PMID 26458123. ^ Siu, AL; U.S. Preventive Services Task, Force (17 November 2015). "Screening for High Blood Pressure in Adults: U.S. Preventive Services Task Force Recommendation Statement.". Annals of internal medicine 163 (10): 778–86. doi:10.7326/m15-2223. PMID 26458123. ^ Franklin, SS; Wilkinson, IB; McEniery, CM (February 2012). "Unusual hypertensive phenotypes: what is their significance?". Hypertension 59 (2): 173–8. doi:10.1161/HYPERTENSIONAHA.111.182956. PMID 22184330. ^ Kario, K (Jun 2009). "Orthostatic hypertension: a measure of blood pressure variation for predicting cardiovascular risk.". Circulation journal : official journal of the Japanese Circulation Society 73 (6): 1002–7. PMID 19430163. ^ Luma GB, Spiotta RT; Spiotta (May 2006). "Hypertension in children and adolescents". Am Fam Physician 73 (9): 1558–68. PMID 16719248. ^ a b c d e f Chobanian AV, Bakris GL, Black HR, Cushman WC, Green LA, Izzo Jr. JL, Jones DW, Materson BJ, Oparil S, Wright Jr. JT, Roccella EJ, et al. (December 2003). "Seventh report of the Joint National Committee on Prevention, Detection, Evaluation, and Treatment of High Blood Pressure". Hypertension (Joint National Committee On Prevention) 42 (6): 1206–52. doi:10.1161/01.HYP.0000107251.49515.c2. PMID 14656957. ^ a b c Giuseppe, Mancia; Fagard, R; Narkiewicz, K; Redon, J; Zanchetti, A; Bohm, M; Christiaens, T; Cifkova, R; De Backer, G; Dominiczak, A; Galderisi, M; Grobbee, DE; Jaarsma, T; Kirchhof, P; Kjeldsen, SE; Laurent, S; Manolis, AJ; Nilsson, PM; Ruilope, LM; Schmieder, RE; Sirnes, PA; Sleight, P; Viigimaa, M; Waeber, B; Zannad, F; Redon, J; Dominiczak, A; Narkiewicz, K; Nilsson, PM; et al. (July 2013). "2013 ESH/ESC Guidelines for the management of arterial hypertension: The Task Force for the management of arterial hypertension of the European Society of Hypertension (ESH) and of the European Society of Cardiology (ESC)". European heart journal 34 (28): 2159–219. doi:10.1093/eurheartj/eht151. PMID 23771844. ^ a b c Mancia G; De Backer G; Dominiczak A; et al. (September 2007). "2007 ESH-ESC Practice Guidelines for the Management of Arterial Hypertension: ESH-ESC Task Force on the Management of Arterial Hypertension". J. Hypertens. 25 (9): 1751–62. doi:10.1097/HJH.0b013e3282f0580f. PMID 17762635. ^ a b c d e f Williams, B; Poulter, NR, Brown, MJ, Davis, M, McInnes, GT, Potter, JF, Sever, PS, McG Thom, S, British Hypertension, Society (March 2004). "Guidelines for management of hypertension: report of the fourth working party of the British Hypertension Society, 2004-BHS IV". Journal of Human Hypertension 18 (3): 139–85. doi:10.1038/sj.jhh.1001683. PMID 14973512. ^ a b c d e National High Blood Pressure Education Program Working Group on High Blood Pressure in Children and Adolescents (August 2004). "The fourth report on the diagnosis, evaluation, and treatment of high blood pressure in children and adolescents". Pediatrics 114 (2 Suppl 4th Report): 555–76. doi:10.1542/peds.114.2.S2.555. PMID 15286277. ^ Chiolero, A; Bovet, P; Paradis, G (Mar 1, 2013). "Screening for elevated blood pressure in children and adolescents: a critical appraisal.". JAMA pediatrics 167 (3): 266–73. doi:10.1001/jamapediatrics.2013.438. PMID 23303490. ^ Daniels, SR.; Gidding, SS. (Mar 2013). "Blood pressure screening in children and adolescents: is the glass half empty or more than half full?". JAMA Pediatr 167 (3): 302–4. doi:10.1001/jamapediatrics.2013.439. PMID 23303514. ^ Expert Panel on Integrated Guidelines for Cardiovascular Health and Risk Reduction in Children and Adolescents; National Heart, Lung, and Blood Institute (Dec 2011). "Expert panel on integrated guidelines for cardiovascular health and risk reduction in children and adolescents: summary report". Pediatrics. 128 Suppl 5: S213–56. doi:10.1542/peds.2009-2107C. PMID 22084329. ^ Moyer, VA.; U.S. Preventive Services Task Force (October 2013). "Screening for Primary Hypertension in Children and Adolescents: U.S. Preventive Services Task Force Recommendation Statement*". Annals of Internal Medicine 159 (9): 613–9. doi:10.7326/0003-4819-159-9-201311050-00725. PMID 24097285. ^ Whelton PK, et al. (2002). "Primary prevention of hypertension. Clinical and public health advisory from the National High Blood Pressure Education Program". JAMA 288 (15): 1882–1888. doi:10.1001/jama.288.15.1882. PMID 12377087. ^ Law M, Wald N, Morris J; Wald; Morris (2003). "Lowering blood pressure to prevent myocardial infarction and stroke: a new preventive strategy" (PDF). Health Technol Assess 7 (31): 1–94. doi:10.3310/hta7310. PMID 14604498. ^ a b c Members, Authors/Task Force; Mancia, Giuseppe; Fagard, Robert; Narkiewicz, Krzysztof; Redon, Josep; Zanchetti, Alberto; Böhm, Michael; Christiaens, Thierry; Cifkova, Renata (2013-06-13). "2013 ESH/ESC Guidelines for the management of arterial hypertension". European Heart Journal 34: eht151. doi:10.1093/eurheartj/eht151. ISSN 0195-668X. PMID 23771844. ^ a b Daskalopoulou, Stella S.; Rabi, Doreen M.; Zarnke, Kelly B.; Dasgupta, Kaberi; Nerenberg, Kara; Cloutier, Lyne; Gelfer, Mark; Lamarre-Cliche, Maxime; Milot, Alain (2015-01-01). "The 2015 Canadian Hypertension Education Program Recommendations for Blood Pressure Measurement, Diagnosis, Assessment of Risk, Prevention, and Treatment of Hypertension". Canadian Journal of Cardiology 31 (5): 549–568. doi:10.1016/j.cjca.2015.02.016. ^ a b "Hypertension | 1-recommendations | Guidance and guidelines | NICE". www.nice.org.uk. Retrieved 2015-08-04. ^ Arguedas, JA; Perez, MI; Wright, JM (8 July 2009). "Treatment blood pressure targets for hypertension.". The Cochrane database of systematic reviews (3): CD004349. doi:10.1002/14651858.CD004349.pub2. PMID 19588353. ^ a b Arguedas, JA; Leiva, V; Wright, JM (Oct 30, 2013). "Blood pressure targets for hypertension in people with diabetes mellitus.". The Cochrane database of systematic reviews 10: CD008277. doi:10.1002/14651858.cd008277.pub2. PMID 24170669. ^ Wright JT, Jr; Fine, LJ; Lackland, DT; Ogedegbe, G; Dennison Himmelfarb, CR (1 April 2014). "Evidence supporting a systolic blood pressure goal of less than 150 mm Hg in patients aged 60 years or older: the minority view.". Annals of internal medicine 160 (7): 499–503. doi:10.7326/m13-2981. PMID 24424788. ^ "KDIGO Clinical Practice Guideline for the Management of Blood Pressure in Chronic Kidney Disease" (PDF). Kidney International Supplements. December 2012. ^ Siebenhofer, A; Jeitler, K; Berghold, A; Waltering, A; Hemkens, LG; Semlitsch, T; Pachler, C; Strametz, R; Horvath, K (2011-09-07). Siebenhofer, Andrea, ed. "Long-term effects of weight-reducing diets in hypertensive patients". Cochrane Database of Systematic Reviews 9 (9): CD008274. doi:10.1002/14651858.CD008274.pub2. PMID 21901719. ^ a b Go, AS; Bauman, M; King, SM; Fonarow, GC; Lawrence, W; Williams, KA; Sanchez, E (Nov 15, 2013). "An Effective Approach to High Blood Pressure Control: A Science Advisory From the American Heart Association, the American College of Cardiology, and the Centers for Disease Control and Prevention". Hypertension 63 (4): 878–885. doi:10.1161/HYP.0000000000000003. PMID 24243703. ^ He, FJ; MacGregor, GA (2004). MacGregor, Graham A, ed. "Effect of longer-term modest salt reduction on blood pressure". Cochrane Database of Systematic Reviews (3): CD004937. doi:10.1002/14651858.CD004937. PMID 15266549. ^ Yokoyama, Yoko; Nishimura, Kunihiro; Barnard, Neal D.; Takegami, Misa; Watanabe, Makoto; Sekikawa, Akira; Okamura, Tomonori; Miyamoto, Yoshihiro (2014). "Vegetarian Diets and Blood Pressure". JAMA Internal Medicine 174 (4): 577. doi:10.1001/jamainternmed.2013.14547. ISSN 2168-6106. ^ Aburto, NJ; Hanson, S; Gutierrez, H; Hooper, L; Elliott, P; Cappuccio, FP (3 April 2013). "Effect of increased potassium intake on cardiovascular risk factors and disease: systematic review and meta-analyses.". BMJ (Clinical research ed.) 346: f1378. doi:10.1136/bmj.f1378. PMID 23558164. ^ a b Brook, RD; Appel, LJ; Rubenfire, M; Ogedegbe, G; Bisognano, JD; Elliott, WJ; Fuchs, FD; Hughes, JW; Lackland, DT; Staffileno, BA; Townsend, RR; Rajagopalan, S; American Heart Association Professional Education Committee of the Council for High Blood Pressure Research, Council on Cardiovascular and Stroke Nursing, Council on Epidemiology and Prevention, and Council on Nutrition, Physical, Activity (Jun 2013). "Beyond medications and diet: alternative approaches to lowering blood pressure: a scientific statement from the american heart association". Hypertension 61 (6): 1360–83. doi:10.1161/HYP.0b013e318293645f. PMID 23608661. ^ Nagele, Eva; Jeitler, Klaus; Horvath, Karl; Semlitsch, Thomas; Posch, Nicole; Herrmann, Kirsten H.; Grouven, Ulrich; Hermanns, Tatjana; Hemkens, Lars G.; Siebenhofer, Andrea (2014). "Clinical effectiveness of stress-reduction techniques in patients with hypertension". Journal of Hypertension 32 (10): 1936–1944. doi:10.1097/HJH.0000000000000298. ISSN 0263-6352. ^ Dickinson, HO; Campbell, F; Beyer, FR; Nicolson, DJ; Cook, JV; Ford, GA; Mason, JM (23 January 2008). "Relaxation therapies for the management of primary hypertension in adults.". The Cochrane database of systematic reviews (1): CD004935. doi:10.1002/14651858.CD004935.pub2. PMID 18254065. ^ Santschi, V; Chiolero, A; Burnier, M (Nov 2009). "Electronic monitors of drug adherence: tools to make rational therapeutic decisions.". Journal of Hypertension 27 (11): 2294–5; author reply 2295. doi:10.1097/hjh.0b013e328332a501. PMID 20724871. ^ Zubcevic J, Waki H, Raizada MK, Paton JF; Waki; Raizada; Paton (June 2011). "Autonomic-immune-vascular interaction: an emerging concept for neurogenic hypertension". Hypertension 57 (6): 1026–33. doi:10.1161/HYPERTENSIONAHA.111.169748. PMC 3105900. PMID 21536990. ^ "WHO Disease and injury country estimates". World Health Organization. 2009. Retrieved 11 November 2009. ^ a b Kearney PM, Whelton M, Reynolds K, Muntner P, Whelton PK, He J; Whelton; Reynolds; Muntner; Whelton; He (2005). "Global burden of hypertension: analysis of worldwide data". Lancet 365 (9455): 217–23. doi:10.1016/S0140-6736(05)17741-1. PMID 15652604. ^ Kearney PM, Whelton M, Reynolds K, Whelton PK, He J; Whelton; Reynolds; Whelton; He (January 2004). "Worldwide prevalence of hypertension: a systematic review". J. Hypertens. 22 (1): 11–9. doi:10.1097/00004872-200401000-00003. PMID 15106785. ^ Burt VL, Whelton P, Roccella EJ, et al. (March 1995). "Prevalence of hypertension in the US adult population. Results from the Third National Health and Nutrition Examination Survey, 1988–1991". Hypertension 25 (3): 305–13. doi:10.1161/01.HYP.25.3.305. PMID 7875754. Retrieved 5 June 2009. ^ a b Burt VL, Cutler JA, Higgins M, et al. (July 1995). "Trends in the prevalence, awareness, treatment, and control of hypertension in the adult US population. Data from the health examination surveys, 1960 to 1991". Hypertension 26 (1): 60–9. doi:10.1161/01.HYP.26.1.60. PMID 7607734. Retrieved 5 June 2009. ^ Ostchega Y, Dillon CF, Hughes JP, Carroll M, Yoon S; Dillon; Hughes; Carroll; Yoon (July 2007). "Trends in hypertension prevalence, awareness, treatment, and control in older U.S. adults: data from the National Health and Nutrition Examination Survey 1988 to 2004". Journal of the American Geriatrics Society 55 (7): 1056–65. doi:10.1111/j.1532-5415.2007.01215.x. PMID 17608879. ^ a b c Lloyd-Jones D, Adams RJ, Brown TM, et al. (February 2010). "Heart disease and stroke statistics--2010 update: a report from the American Heart Association". Circulation 121 (7): e46–e215. doi:10.1161/CIRCULATIONAHA.109.192667. PMID 20019324. ^ "Culture-Specific of Health Risk". Stanford. Retrieved 12 April 2014. ^ Falkner B (May 2009). "Hypertension in children and adolesents: epidemiology and natural history". Pediatr. Nephrol. 25 (7): 1219–24. doi:10.1007/s00467-009-1200-3. PMC 2874036. PMID 19421783. ^ "Global health risks: mortality and burden of disease attributable to selected major risks" (PDF). World Health Organization. 2009. Retrieved 10 February 2012. ^ Lewington S, Clarke R, Qizilbash N, Peto R, Collins R; Clarke; Qizilbash; Peto; Collins; Prospective Studies (December 2002). "Age-specific relevance of usual blood pressure to vascular mortality: a meta-analysis of individual data for one million adults in 61 prospective studies". Lancet 360 (9349): 1903–13. doi:10.1016/S0140-6736(02)11911-8. PMID 12493255. ^ Singer DR, Kite A; Kite (June 2008). "Management of hypertension in peripheral arterial disease: does the choice of drugs matter?". European Journal of Vascular and Endovascular Surgery 35 (6): 701–8. doi:10.1016/j.ejvs.2008.01.007. PMID 18375152. ^ a b c d e f g h Esunge PM (October 1991). "From blood pressure to hypertension: the history of research". J R Soc Med 84 (10): 621. PMC 1295564. PMID 1744849. ^ a b Kotchen TA (October 2011). "Historical trends and milestones in hypertension research: a model of the process of translational research". Hypertension 58 (4): 522–38. doi:10.1161/HYPERTENSIONAHA.111.177766. PMID 21859967. ^ Postel-Vinay N, ed. (1996). A century of arterial hypertension 1896–1996. Chichester: Wiley. p. 213. ISBN 0-471-96788-2. ^ "The medieval origins of the concept of hypertension". Heart Views 15 (3): 96–98. 2014. doi:10.4103/1995-705X.144807. Retrieved 25 November 2014. ^ "Avicenna's doctrine about arterial hypertension.". Acta Med Hist Adriat 12: 157–62. 2014. PMID 25310615. Retrieved 25 November 2014. ^ Swales JD, ed. (1995). Manual of hypertension. Oxford: Blackwell Science. pp. xiii. ISBN 0-86542-861-1. ^ a b Dustan HP, Roccella EJ, Garrison HH; Roccella; Garrison (September 1996). "Controlling hypertension. A research success story". Arch. Intern. Med. 156 (17): 1926–35. doi:10.1001/archinte.156.17.1926. PMID 8823146. ^ Novello FC, Sprague JM; Sprague (1957). "Benzothiadiazine dioxides as novel diuretics". J. Am. Chem. Soc. 79 (8): 2028–2029. doi:10.1021/ja01565a079. ^ Chockalingam A (May 2007). "Impact of World Hypertension Day". Canadian Journal of Cardiology 23 (7): 517–9. doi:10.1016/S0828-282X(07)70795-X. PMC 2650754. PMID 17534457. ^ Chockalingam A (June 2008). "World Hypertension Day and global awareness". Canadian Journal of Cardiology 24 (6): 441–4. doi:10.1016/S0828-282X(08)70617-2. PMC 2643187. PMID 18548140. ^ Alcocer L, Cueto L; Cueto (June 2008). "Hypertension, a health economics perspective". Therapeutic Advances in Cardiovascular Disease 2 (3): 147–55. doi:10.1177/1753944708090572. PMID 19124418. Retrieved 20 June 2009. ^ William J. Elliott (October 2003). "The Economic Impact of Hypertension". The Journal of Clinical Hypertension 5 (4): 3–13. doi:10.1111/j.1524-6175.2003.02463.x. PMID 12826765. ^ Coca A (2008). "Economic benefits of treating high-risk hypertension with angiotensin II receptor antagonists (blockers)". Clinical Drug Investigation 28 (4): 211–20. doi:10.2165/00044011-200828040-00002. PMID 18345711. James, Paul A.; Oparil, Suzanne; Carter, Barry L.; Cushman, William C.; Dennison-Himmelfarb, Cheryl; Handler, Joel; Lackland, Daniel T.; Lefevre, Michael L.; MacKenzie, Thomas D.; Ogedegbe, Olugbenga; Smith, Sidney C.; Svetkey, Laura P.; Taler, Sandra J.; Townsend, Raymond R.; Wright, Jackson T.; Narva, Andrew S.; Ortiz, Eduardo (18 December 2013). "2014 Evidence-Based Guideline for the Management of High Blood Pressure in Adults". JAMA 311 (5): 507–20. doi:10.1001/jama.2013.284427. PMID 24352797. Validation of a novel traditional chinese medicine pulse diagnostic model using an artificial neural network. Tang AC, Chung JW, Wong TK.SourceSchool of Nursing, Caritas Medical Centre, Hong Kong. Evidence-based complementary and alternative medicine : eCAM.Evid Based Complement Alternat Med.2012;2012:685094. Epub 2011 Sep 13. Gil-Extremera B, Cia-Gomez P.SourceService of Internal Medicine, Hypertension and Lipid Unit, "San Cecilio" University Hospital, Granada, Spain. International journal of hypertension.Int J Hypertens.2012;2012:859176. Epub 2011 Aug 16. SLC9A9 mutations, gene expression, and protein-protein interactions in rat models of attention-deficit/hyperactivity disorder. Zhang-James Y, Dasbanerjee T, Sagvolden T, Middleton FA, Faraone SV.SourceDepartment of Psychiatry, SUNY Upstate Medical University, Syracuse, New York. American journal of medical genetics. Part B, Neuropsychiatric genetics : the official publication of the International Society of Psychiatric Genetics.Am J Med Genet B Neuropsychiatr Genet.2011 Dec;156B(7):835-43. doi: 10.1002/ajmg.b.31229. Epub 2011 Aug 19.